Observation and assessment of children is an integral part of the program at Glasser Preschool. 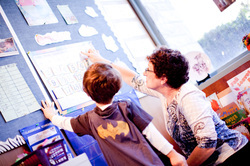 Assessment serves several important purposes, including: monitoring children’s developmental progress and learning; guiding curriculum planning and decision making by identifying children’s interests and needs; identifying children who might benefit from special services; planning program improvement; and communication with teachers, Director, and families. We assess children on an ongoing basis throughout the school year. Some of the tools that teachers use to assist in the assessment of children include: developmental checklists, work samples, interest surveys, anecdotal evidence, and photos. The teachers use these assessment records for both curriculum planning and communications with families throughout the school year. There are two formal parent/teacher conferences scheduled during the school year. Teachers also maintain ongoing communication with families throughout the school year and have additional meetings with families as necessary for the individual child. We are always available to meet and discuss any needs or concerns you may have regarding your child. If your child’s teacher and the Director believe that your child has behavioral challenges or special learning needs that require further evaluation, we will work closely with you as a team. We will meet with you and make appropriate referrals for further evaluation and help guide you through the process. We will work our hardest to implement program modifications and individual treatment plans in consultation with experts to the extent that we can accommodate such changes within our program. The teachers and Director maintain files for each child in a manner that maintains confidentiality. This information shall only be disclosed to the child’s guardians, Glasser Preschool Director, and other Glasser Preschool teachers and specialists who work with the child. Disclosure beyond these individuals shall require written permission from a parent or guardian. However, when we have reason to believe that a child’s welfare is at risk, it is permissible to share confidential information with agencies, as well as with individuals, who have legal responsibility for intervening in the child’s interest.